The place that hosts the Tam-Tam Jam on one side also has Canada’s largest cemetery on the other. At the mountain’s summit, there’s a lake that turns into an ice skating rink come winter. Joggers loop around the mountain and cross-country skiers go from the top to Parc Ave. It’s where the medieval live action role-players will battle it out on Sunday afternoons and where the giant cross, a symbol of Montreal’s Catholic history, will glow purple as the Vatican looks around for a new Pope. The mountain that was considered wild countryside for Montrealers back when the Old Port was all that existed of our city has become a sanctuary for animals and rare plants and an escape for the urbanites who sprang up around it. Leetmaa added that if Montreal was designed like a typical North American city, it would revolve around a business sector that people would clear out from at night. Without parks, urban density can be overwhelming. When Mount Royal Park was established some 150 years ago, people just knew the city wouldn’t do as well without it. When a farmer cut down a chunk of the mountain’s forest during a particularly cold winter in the mid-1800s, Montrealers realized how much they liked their namesake patch of green. So Frederick Law Olmsted (the landscape designer who crafted Central Park in New York City) was called in to design something that capitalized on the mountain’s natural beauty. Gabrielle Korn, a representative for the non-profit group Les Amis de la montagne, said that the mountain and its paths were designed for people of any social standing or physical ability. “I think Montrealers have a huge sense of ownership of the mountain,” she said. That sense of ownership is why, when mayor Jean Drapeau decided in the 1970s that the mountain would bow out as a natural site and become a place of parking lots and businesses, citizens mobilized and created Les Amis de la montagne. The group now works to preserve the mountain and promote it to the larger community. Korn said her group is partnered with the city, but runs independently. Although the fight to preserve the mountain let up a bit since it became a recognized historic site in 2005, there are still threats. Korn points to changing bylaws in Montreal that would allow developers to build condos taller and more densely. Developments like this would block a view of the mountain for many Montrealers and it’s something Les Amis de la montagne is on top of. Korn said that even being able to see the mountain is valuable, given that offices and condos with a view of the mountain are the most expensive. Leetmaa added that the mountain boosts property values all around it, so the decision not to build those parking lots a few decades ago has paid off for the city. “The sight-lines in the city were quite well done, and it would be a shame to compromise that,” Leetmaa said. An integral part of maintaining the mountain is also preserving the flora and fauna on it. Despite all the cars and activity around it, Mount Royal is its own ecosystem. According to Korn, there are 20 species of mammals and 180 species of birds that live on the mountain, as well as indigenous plants, and they are all under constant threat from what Korn calls “invading species” and people. Volunteers patrol the park and make sure people aren’t doing no-nos, like feeding the raccoons. 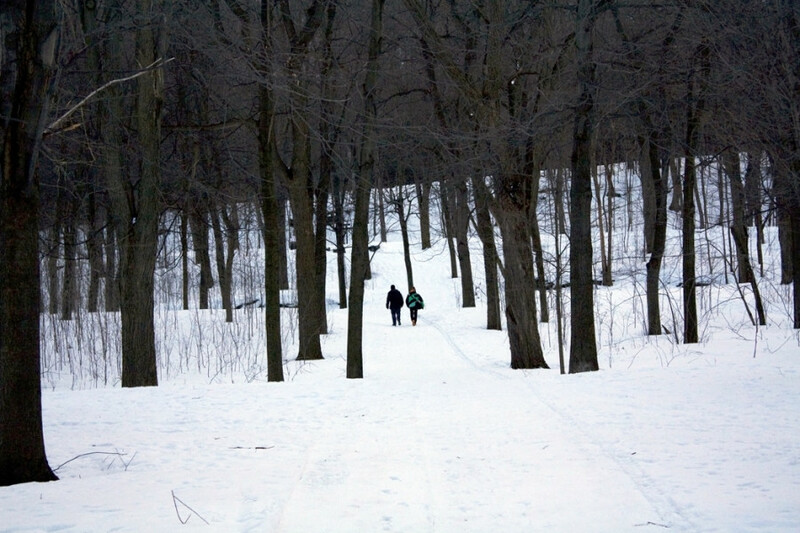 Around 700 people help to maintain the park, combing over Mount Royal in May to clean and plant trees; since 1994, about 18,000 trees have been planted. A summit is being planned for the spring by Les Amis to de la montagne to determine where the past decade has brought them and how to best move forward in preserving and protecting the mountain. Inner Tubing: Renting a giant tube makes you feel like a kid again, and sliding down the hillside near the Lac aux Castors is pretty great. Grab a tube at the chalet and it’s yours for the day. Beaver Lake Chalet / $9.00 per tube per day. 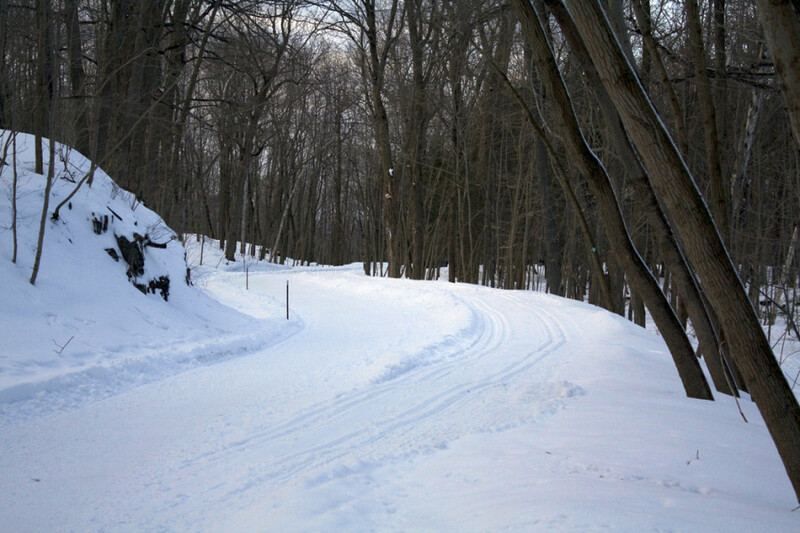 Cross-Country Sking: With 22 km of trails and something for every skill level, the mountain can be seen from a whole new vantage point. It feels like you’ve escaped the city, but you’re still conveniently close to your dinner reservations. Beaver Lake Chalet / $12.00 for an hour or $17.00 for 3 hours. Exhibition: Winter on the Mountain 150 Years Ago: This exhibition in the Maison Smith offers historical photographs and animation about what the mountain was like when it was recognized simply as a valuable part of the city. Maison Smith (1260 Remembrance Rd.) / Free. Tam-Tam Jam: Every Sunday in summer—or whenever the dial is above 10 C—the free spirits of the city gather near the monument to Sir George-Étienne Cartier (Parc Ave. and Duluth Ave.) with their drums, pets, toys and friends, picnicking (read: drinking wine) and relaxing together. Drummers by the statue are the nucleus of the site, but guitar players, Frisbee lovers and people just enjoying the company of friends or a good book sprawl all over the mountainside. Free. Notable mentions: Join the medieval battle, go for a stroll (walk up Peel St. and take the newly re-done stairs to the Serpentine Rd. and walk along it to the summit or lookout point), bike to the summit on Olmsted Rd.—but not too quickly, as there are usually plenty of pedestrians.